Kitchen remodeling in Cypress CA can be a big investment. It’s important to trust your investment to a true professional like Cabinet Magic. At Cabinet Magic, we have over 30 years of experience in cabinet fabrication and remodeling. We know exactly how to get you the high quality products you need and manage all the moving pieces of the project so that the work gets done on time, on budget, and with superior quality craftsmanship. When you’re just changing one aspect of your kitchen, such as your countertop or your flooring, it’s not too difficult to imagine the finished result. However, the more complex your kitchen remodeling in Cypress CA is and the more aspects of the kitchen you change, the harder it is to really visualize what you’re getting yourself into. For example, maybe your backsplash tile will suddenly look too busy when it covers a whole wall, or perhaps the new placement of your fridge will turn out less convenient than you’d hoped. With Cabinet Magic as your contractor, you’ll never get left in suspense regarding how your kitchen remodeling in Cypress CA will turn out. We know you want to feel confident of what you’re getting before you entrust us with the project. That’s why we offer 3D computer rendering services on every remodeling project. You’ll be able to see and approve all aspects of the design down to the last detail before we begin work. 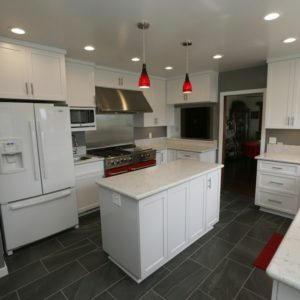 Are you ready to stop dreaming of kitchen remodeling in Cypress CA and start actually making it happen? Call Cabinet Magic at 800-828-4380 now and request your free in home consultation. We’ll go over your wish list with you and provide an estimate for the necessary remodeling work.